Manipur police in collaboration with BSF have rescued around 107 Nepalese women from being trafficked and arrested two suspected human traffickers in raids in Manipur capital Imphal and Moreh on the Indo-Myanmar border, police sources said on Saturday. The women are said to be between 20-35 years of age. According to police sources, while they were able to rescue 107 women, more than 60 had already been trafficked to Myanmar through the same route between January 29 to 30. In the first swoop on Friday, 40 girls were rescued and a suspected trafficker accompanying them arrested from two hotels in Moreh by a state police team stationed in Tengnoupal district bordering Myanmar. “The operations were conducted based on inputs by some NGOs,” police sources in Moreh said. “Now we’ve handed the girls over to the concerned officials for further steps”. In follow up operations in state capital Imphal later on the same day, 61 more girls were rescued and another suspected trafficker arrested. Official sources say they were going to be trafficked to different cities in South Asia and the Middle East. 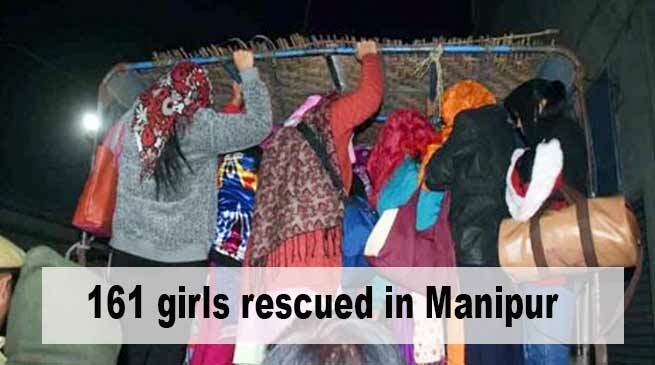 However some of the girls who have currently been accomodated in a rehabilitation home, claimed that they had come on a sightseeing tour of Manipur, said an official of the Society for Progressive Development, the NGO are currently in a home claimed that they come to see the state while some others claim that they are on a tour, according to S Nando, a functionary of Society for Progressive Development, the NGO that runs the home in Imphal. Meanwhile, there are reports of more rescues including of males in subsequent operations in and around Imphal and its airport on Sunday. Officials say that the total number of persons rescued is likely to go up once verification is done.